Home / Africa Day / AU / Kwame Nkurumah / News / OAU / Happy Africa Day Bantu! What Does Africa Day Mean To You? Happy Africa Day Bantu! What Does Africa Day Mean To You? Happy Africa Day to you all! 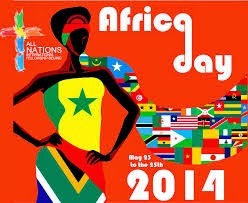 Africa Day is an annual celebration on the African calender. The day commemorates the founding of the Organisation of African Unity (now known as the African Union) which was founded on 25th May 1963 in Addis Ababa, Ethiopia where the AU's headquarters are situated. Former president of Ghana, the late Kwame Nkurumah was one of the founding fathers of the OAU, a Pan-African at heart who led Ghana to its first independence in 1957. Africa Day aims to celebrate being African and promoting unity and solidarity amongst Africans; celebrating our culture, heritage, history and diversity and a shared identity as Africans. All the ideas about Africa Day sound interesting, don't they? But, as Africans those on the continent and the diaspora, are we living up to these ideas the founding members envisioned? What does being African mean to us? Does it carry any relevance in our lives? All these questions come to mind; Africa Day is a day of reflection, reflecting on our reality as Africans. As Africans, so many people feel the need to sell us dreams of what our reality is/should be. We should reclaim our reality as a people by, firstly, reclaiming our IDENTITY, owning it and taking pride in it without having to explain ourselves. Before attaining unity, we need to understand and practice the notion of, 'charity begins at home'; knowing thyself before claiming unity is paramount. Enough with appropriation of other people's identity. Rise and Be YOU! With that said, of what significance is Africa Day to you?